This V-Gear Talkcam Tracer webcam can follow you around the room, allowing you to pace back and forth manically while spouting off your stream-of-conscious right-wing tirades for your vidcast without worrying about going out of frame. After all, nothing will diminish your point about the homosexual agenda like being half out of the shot. 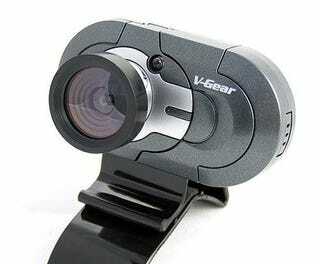 In addition to its motion-sensing capabilities, the Tracer can take 1.3-megapixel stills and capture video at 30 FPS. It's all yours for $78.50 of your hard-earned American dollars.